You are now able to craft Psijic Ambrosia, an Experience point booster that gives you 50% boost to Experience gained from any source and all sources for 30 minutes. Psijic Ambrosia is considered a drink, and thus works with Provisioner passives that affect drinks. When can you use these? Psijic Ambrosia can be used at any level or Veteran Rank. The boost applies towards advancing your level, advancing your Veteran Rank, and for advancing your Champion Points. It does not apply towards things that don’t work off of Experience Points, like the Mages Guild and crafting skill lines. Psijic Ambrosia does not stack with itself. If you attempt to use one right after the other, you’ll fail to use the second item (but will still exist in your inventory). You can only have one consumable Experience Point Booster active at a time – if you’ve just consumed a Psijic Ambrosia, you cannot consume another Psijic Ambrosia until the first Psijic Ambrosia’s duration runs out. 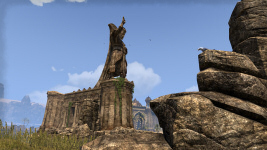 Psijic Ambrosia WILL stack with all other sources of Experience Point boosting such as the Rings of Mara, ESO Plus, your Alliance owning enemy keeps, or being in a group. Note that although Psijic Ambrosia is considered a drink for the purposes of Provisioning, it does NOT prevent you from also having a food or drink buff active. This means you can drink a Psijic Ambrosia, and immediately drink some Red Rye Beer, and you will have both effects active on you. If you have the Brewer passive, you’ll make more units of Psijic Ambrosia per crafting attempt. This means that, at maximum Brewer rank, you’ll make four units of Psijic Ambrosia every time you craft that recipe. If you have the Connoisseur passive, the duration of any Psijic Ambrosia you drink will be increased. This means that, at maximum Connoisseur rank, each unit of Psijic Ambrosia you drink will last 50 minutes, rather than the listed 30 minutes. Taken together, someone who is both a fully-ranked Brewer and Connoisseur creating Psijic Ambrosia for their own use will get a total of three hours and twenty minutes of Experience boost from a single crafting of the recipe. How do you make Psijic Ambrosia? The recipe for Psijic Ambrosia cannot be found whole. Rather, it comes in seven parts, each distinct from the other. These recipe fragments can be found by completing Provisioner Writs; the higher ranked Writ you complete, the more likely you are to find a fragment of the recipe. Recipe fragments can be traded or sold to other players, however, so an industrious Provisioner who has two fragments could trade or sell one of them to get a fragment they do not have. Once you have all seven fragments, simply use any single fragment from either your inventory or the quickslot. This will consume all seven fragments, and will produce one complete and usable Psijic Ambrosia Recipe. This, too, can be sold or traded to other players. Consuming the recipe itself will finally endow you with the knowledge to craft Psijic Ambrosia! Psijic Ambrosia has three ingredients required to make it: Frost Mirriam, Bervez Juice, and Perfect Roe. Frost Mirriam and Bervez Juice are both existing ingredients used in a variety of high-end purple foods and drinks; they can only be found by completing Provisioner Writs or by receiving them from your Hireling. Perfect Roe is brand-new, however, and (at least for the moment) used only in the crafting of Psijic Ambrosia. Perfect Roe can be found by fishing. Every time you skin a non-trophy fish, you obtain fish meat. However, you will now also have a small chance to obtain Perfect Roe. Note that this chance is not affected by any passives, Champion abilities, or anything else. Finally, to craft Psijic Ambrosia, you must have your Recipe Quality passive at Rank 4 (which is a new Rank for this patch) and your Recipe Improvement passive at Rank 6; that is, both must be maxed out. With Perfect Roe, Bervez Juice, and Frost Mirriam in-hand, you can go to any cooking fire and craft Psijic Ambrosia! In this patch, we’ve implemented limited scaling on all consumables that affect your Health, Magicka, or Stamina. Please note the battle leveling changes we described last week on the forums will be implemented in our next incremental patch. Scaling will occur across level ranges, and is determined by the base level of the item up to the next viable level of a crafted item. For example, crafted potions are made at levels ending in 0 starting at level 10 (until you reach Veteran Ranks). If you create a level 10 potion, it will scale with you as you level, until level 19. At level 19, it will “lock” at that strength and never get any better. It will still be good at level 20, but not the best thing for you at your level. This behavior applies to foods and drinks as well. Note that Crown Store potions and foods have always scaled with your level. With this new system, crafted and dropped consumable items do too, and so at no point will there be a moment in which a Crown Store potion is ever directly stronger than one that is crafted. Fixed an issue where you would hold your shield at an awkward angle while blocking. Fixed an issue that was causing some player characters to fly through the air using certain abilities. All Crown Store Riding Lessons now display their description text on French game clients. Increased the base attack damage from Flesh Atronachs found throughout this dungeon. Fixed an issue on the Mac game client where you were unable to use the map’s zoom function when it was initially opened. Updated the text for Error <<1>> to display as Unknown Error to avoid further confusion. Fixed a heavy sack near Elden Root that was respawning faster than intended.